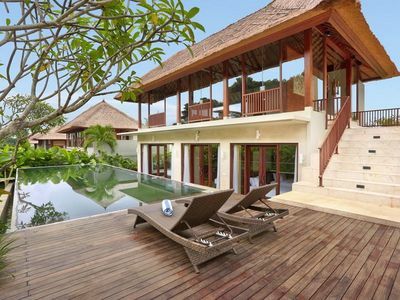 Huge, luxury Private Villa. Free Breakfast & Transfers for 3 or 7 nights Min. 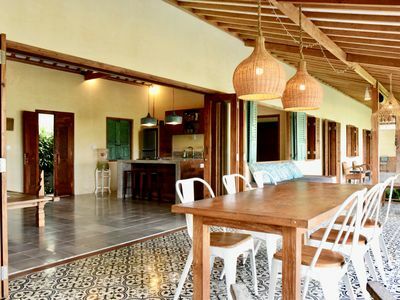 Villa Nyumpené is one of Bali's most desirable villas - only 7kms from the airport and around a 10 minute walk to the famed Legian and Seminyak beaches - is ready for rental for up to 7 people. 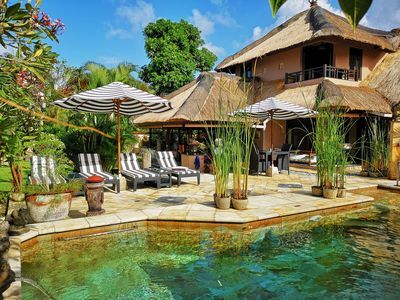 1600sqm of lush gardens, 3 deluxe bedrooms, a villa manager, maid and gardener are there to ensure your holiday is as sublime as it should be. 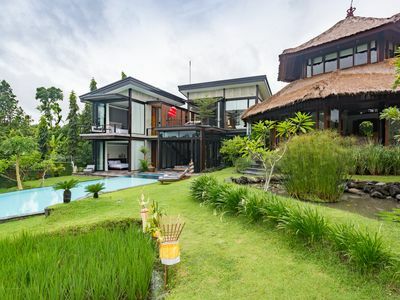 Designed with traditional Indonesian open living spaces but engineered to European standards, the villa is a stunning example of modern Asian-living. 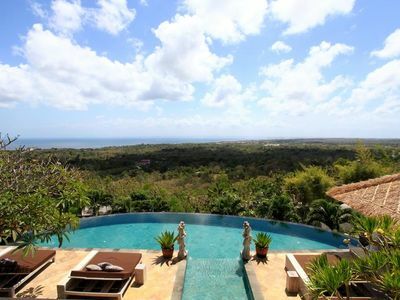 The name Nyumpené is ancient Sanskrit for ‘Dreams’ and we have endeavored to indeed make this a residence of dreams. 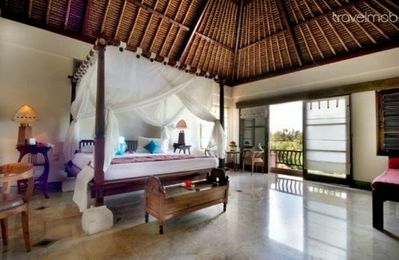 The villa has been completely renovated with new furnishings, textiles and the addition of new outdoor bathrooms in 2 of 3 bedrooms. Every room now boasts luxuriously soft and colourful fabrics from world-famous Thai Silk and Fabric purveyor, Jim Thompson. The pool is 50 square meters of emerald & blue stone-tiling which changes colour throughout the day. With 6 sunbed loungers around the pool, it’s an idyllic place to be with friends and family or to just kick back with a book. 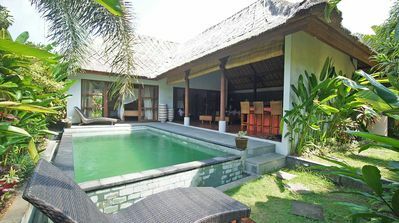 In the corner next to the pool-house is a unique feature of Nyumpené – the massage bale. We will recommend extremely competent masseurs to ease aching muscles. You have your own private guest kitchen to use – and it’s fully equipped with two gas rings, refrigerator, microwave oven, pots, pans plates and cutlery. 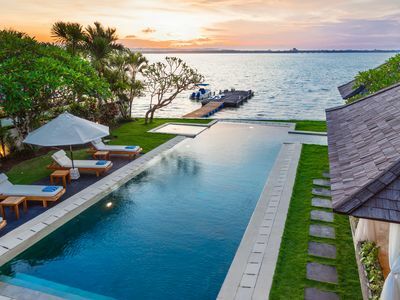 There is of course a BBQ which we can set up for you by the pool – a few cold beers in hand, a smoking BBQ and good friends, it’s a perfect way to see in the sunset. To top it all off, you have your own private entrance off a quiet lane which opens out into a beautiful courtyard complete with garage for your rental car or bikes. The Villa has three comfortable bedrooms, one on the upper floor with a loggia and two on the ground floor, each with a small terrace. 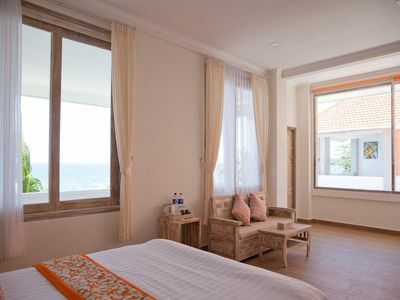 The bedrooms are furnished with 2 x 2 meter king size beds. The white tiled bathrooms each have a large shower cabin, WC and a bidet and outdoor garden shower area. A lot of storage space is provided by the long washbasins made of marble. Five-meter wide sliding doors separate the bedrooms from the terraces. With thick pile carpets on either side of the bed, an antiqued Chinese Cabinet for storage and an old Javanese chair covered in rich Jim Thompson fabrics, the red room evokes warmth and comfort coupled with a dash of romance. This is the largest bedroom with a huge indoor-outdoor bathroom. With thick pile carpets on either side of the bed, a beautiful blue Chinese Cabinet for storage and an old Javanese chair covered in rich Jim Thompson fabrics, the blue room is cool and calm. 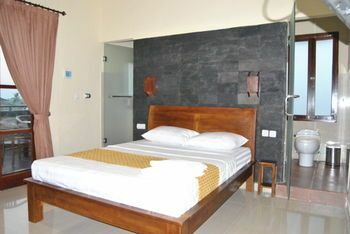 This is the second largest bedroom also with a large indoor-outdoor bathroom. This is the smallest of the three bedrooms, but makes up for it with a balcony over looking the pool and gardens. With a private toilet off the bedroom, the main bathroom is downstairs - it's complete enclosed for total privacy. A 7th person can easily be accommodated on the sofa or the Cleopatra Lounger in the living room. Although not air-conditioned, there are two ceiling fans in the large open plan space and the bathroom access would be to the Yellow Bedroom. 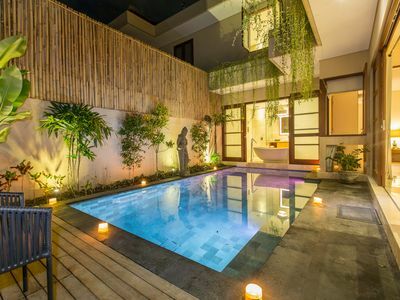 Elegantly designed, the outdoor -indoor living spaces of Nyumpené are to die-for. A large, spacious living room tastefully decorated and furnished is ideal to relax in the evenings with a cold beer or cocktails. The dining area is adjacent to the living room and can seat up to 8 people. You also have access to your own fully-equipped guest kitchen complete with fridge, gas hob cooker, microwave oven and a host of gadgets. Can't find a pot or a pan here? Then head into the larger kitchen where you will be able to find what you need. 6 loungers and two umbrellas keep you shaded during the day - and there is of course, ample shade throughout the massive garden. And don't forget, we even have our own massage bale. 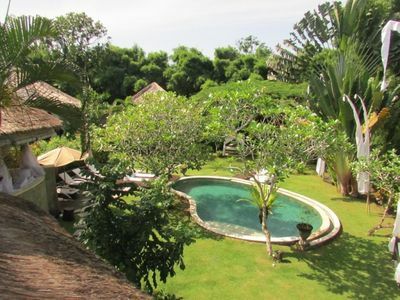 The Villa is staffed by a wonderfully delightful Manager, Ketut. She will be your host and 'Ms. Fixit' for all your needs whilst in Bali. 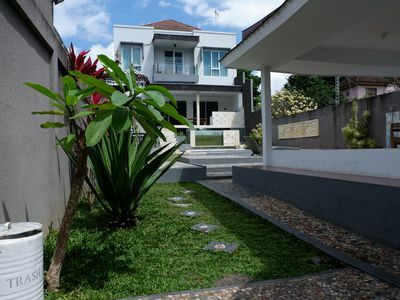 Ketut is supported by a gardener and a maid to ensure that your stay is perfect in looks, comfort and cleanliness. At Nyumpené we try everyday to make a little difference to the immediate as well as the local environment. We only use energy-saving LED lighting, and even some solar powered lanterns for the garden. Rechargable batteries are used for the candles and other small electrical items. All of our water is drawn from our own well – 40m below ground! It’s cold, fresh and has zero hint of chlorine or other chemicals in use today. Our laundry bags are made of canvas – not plastic. We are growing our herbs and spices which you are free to help yourself to – we hope you like chillies! It’s a constant work in progress though and we welcome green fingered guests to potter around if you enjoy that! We have also started to build our own compost bin for the garden cuttings and waste from the kitchens. Please do contribute to this effort – it’s a nice thought that every guest through Nyumpené has made a contribution to the ecology of our gardens. 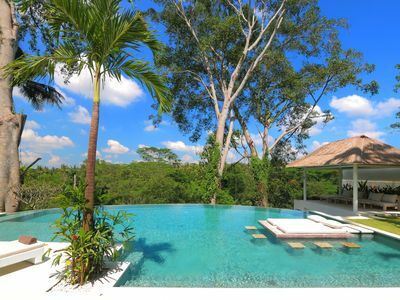 Shut the garden doors behind you and you’re immediately enveloped in the sound of birds and the rustle of the sugar palm fronds high above you. 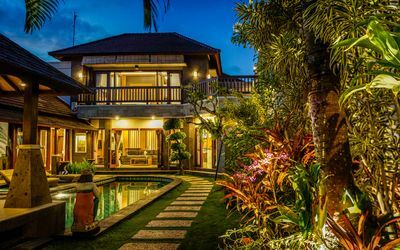 Legian and Seminyak beaches are just 10 to 12 minutes away – if you don’t stop for a meal drink or dispose of some cash in a shop. As with most Balinese beaches you can rent surfboards and bodyboards or buy a cool beer at the small stands. Jalan Sri Rama on one side offers a range of neat home-cooked warungs (small restaurants) offering everything from Nasi Campur to Nasi Padang and everything Indonesian in between. Jalan Legian and Jalan Padma on the other side offer a more eclectic range of shopping and eatery options. Bintang Supermarket is a 10 minute away straight up Jalan Legian and we have a list of great butchers that you can visit if you’re looking for something special for a BBQ at Nyumpené. The local post office is 3 minutes away – if you are a traditionalist and still value sending postcards home! Further afield, you can get out about with the help of Blue Bird taxis (bit of a hassle sometimes) but a better option if you have a smartphone is download GoJek or Grab ride services. With these operators a genial driver on a motorbike or an air conditioned car will pick you up and whisk you to your destination. We will happily help you download these apps and teach you how to use them – or we can order transport for you. The rates are Inclusive of local tax of 10% and fully cooked breakfast each morning. Transport to / from the international airport can be arranged for an additional fee (depends on how many people and therefore size of car). Just ask us for help. For 7 nights minimum stay - free round-trip transfers. 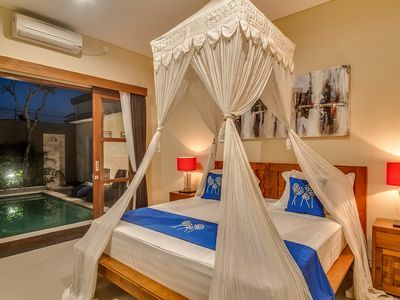 1 Bedroom Poll Villa "K"